A friend of mine was trying to explain to her boyfriend the amazingness of the twice baked potato. I don't know if she convinced him that they are worth making but I do know that they are a FAVORITE food of mine. Usually they are served as a side dish but this bad boy is a full on meal. No need to make anything else because this has everything all in one nice little package. Plus it tastes like totally amazing junk food. It's NOT though. It's fan-freaking-tastic plant strong food that makes you wanna shake people that say "You're vegan? What do you even eat??! Lettuce?" - No way bro, I eat VEGAN cheesy broccoli and tofu bacon stuffed twice baked potatoes, chili cheese fries, tacos, sandwiches, wraps, soups, chips and guacamole, stir fry, curries, and ten million other things. 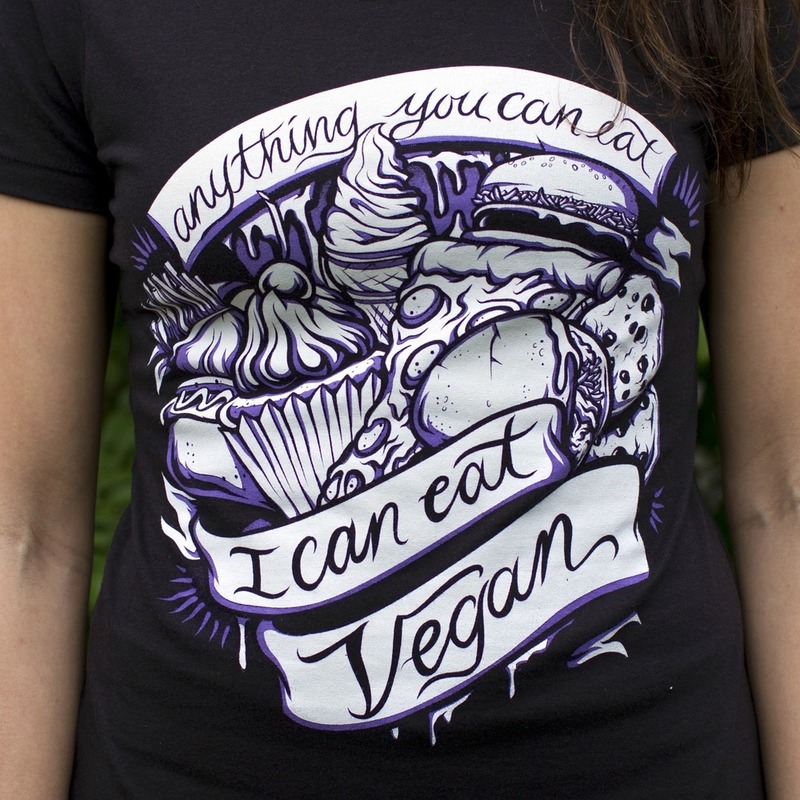 "Anything you can eat, I can eat VEGAN!" You could also use other veggies instead of the broccoli if you want - kale, spinach, collards, cauliflower, etc! I just have, since I was a wee lass, loved the the combo of cheese and broccoli. Now, of course, I eat AWESOME vegan cheese and broccoli. Ahh I love my life. Preheat your oven to 425. Wash your potatoes really well and poke a bunch of holes in them with a fork. (Trust me, if you don't, they can explode and make a HUGE mess all over the oven!) Though this recipe just calls for 2 large or 4 medium potatoes, I tend to cook 10-12 potatoes at a time so I have some in the fridge at all times waiting for me. It's a great snack or easy start to a meal just waiting in your fridge! (Being prepared is one major key to eating healthy!) Stick the potatoes directly on the rack in the oven and bake until tender - about an hour. About 10 minutes before the potatoes are done bring a large pot of water to a boil. Drop all of the broccoli in and cook for about 1 minute, just to blanch them. Drain them and then cool them down in the strainer with some cold water to stop the cooking. Drain throughly and set half of the broccoli aside. Finely chop the other half of the broccoli and put into a medium sized bowl. Leave the oven on because you are going to be sticking these back in real soon. Take them out and let them sit until they are just cool enough to handle, but still pretty hot. Cut them in half lengthwise. Now take a spoon and scoop out some of the flesh leaving about 1/4" of flesh around the skin. Put the scooped flesh in the bowl with the chopped broccoli. Add the non dairy milk, green onions, 1/4 cup of the Chili Cheese Sauce and then add salt and pepper to taste. Mix thoroughly. Add more non dairy milk if necessary. Now place the potato halves back on your pan and stuff them with the broccoli potato mix (just spread out that mix evenly between the potato halves.) Once stuffed, top the potatoes with the remaining broccoli florets. Now pour the remaining cheese sauce over the top of each potato. Sprinkle the Tofu Bacon on top of the cheese sauce. Put back in the oven and bake for 15-20 minutes, or until it's heated throughout. Take out and DEVOUR! Yum! **If you have leftover chili cheese sauce or tofu bacon they will both keep in the refrigerator for at least a week as long as they are well covered.